Learning the 10 rules of badminton is the first step towards getting into the game. Besides these, it's a good idea to get to know more about the equipment laws, which govern what equipments can be used - the design of the racquet, the weight and shape of the shuttlecock (for correct speed). Back Alley - Area between the back boundary line and the long service line for doubles. Backcourt - Back third of the court, in the area of the back boundary lines. Balk (Feint) - Any deceptive movement that disconcerts an opponent before or during the service. Baseline - Back boundary line at each end of the court, parallel to the net. Carry - An illegal tactic, also called a sling or a throw, in which the shuttle is caught and held on the racquet and then slung during the execution of a stroke. Center or Base Position - Location in the center of the court to which a singles player tries to return after each shot. Center Line - Line perpendicular to the net that separates the left and right service courts. Clear - A shot hit deep to the opponents back boundary line. The high clear is a defensive shot, while the flatter attacking clear is used offensively. 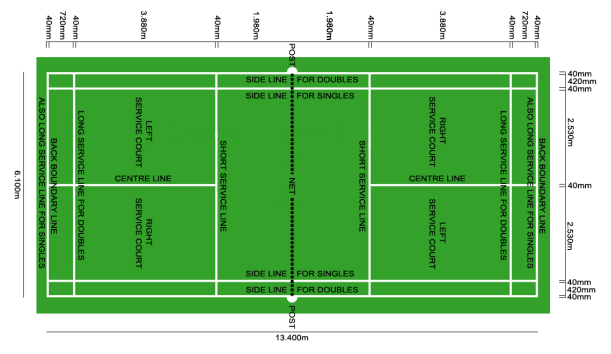 Court - Area of play, as defined by the outer boundary lines. Drive - A fast and low shot that makes a horizontal flight over the net. Drop - A shot hit softly and with finesse to fall rapidly and close to the net on the opponent's side. Fault - A violation of the playing rules, either in serving, receiving, or during play. Feint (Balk) - Any deceptive movement that disconcerts an opponent before or during the service. Flick - A quick wrist and forearm rotation that surprises an opponent by changing an apparently soft shot into a faster passing one; used mostly on the serve and at the net. Forecourt - Front third of the court, between the net and the short service line. Hairpin Net Shot - Shot made from below and very close to the net with the shuttle rising, just clearing the net, and then dropping sharply down the other side. The shuttle's flight approximates the shape of a hairpin. Halfcourt Shot - A shot hit low and to midcourt, used effectively in doubles against the front-and-back formation. Kill - fast downward shot that cannot be returned. Let - A legitimate cessation of play to allow a rally to be replayed. Long Service Line - In singles, the back boundary line. In doubles a line 2-1/2 feet inside the back boundary line. The serve may not go past this line. Match - A series of games to determine a winner. Midcourt - The middle third of the court, halfway between the net and the back boundary line. Net Shot - Shot hit from the forecourt that just clears the net and then falls rapidly. Push Shot - Gentle shot played by pushing the shuttle with little wrist motion, usually from the net or midcourt to the opponent's midcourt. Racket - Instrument used by the player to hit the shuttlecock. Made from metal alloys (steel/aluminum) or from ceramic, graphite or boron composites. Generally strung with synthetic strings. Rally - Exchange of shots while the shuttle is in play. Serve (Service) - Stroke used to put the shuttlecock into play at the start of a rally. Service Court - Area into which the serve must be delivered. Different for singles and doubles play. Short Service Line - The line 6-1/2 feet from the net which a serve must reach to be legal. Shuttlecock (Shuttle) - Official name for the object that the players must hit. Composed of 16 goose feathers attached to a cork base covered with leather. Synthetic shuttles are also used by some. Smash - Hard-hit overhead shot that forces the shuttle sharply downward. Badminton's primary attacking stroke.